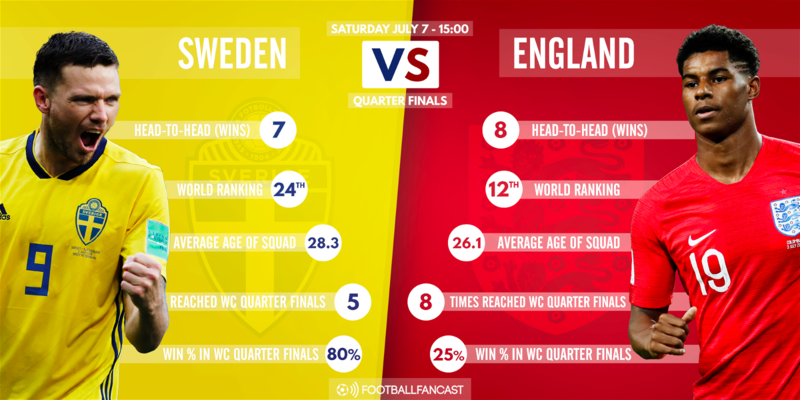 It’s been a thrilling World Cup for England fans and they won’t want it to end on Saturday – especially considering Sweden hardly represent the most intimidating of opposition. 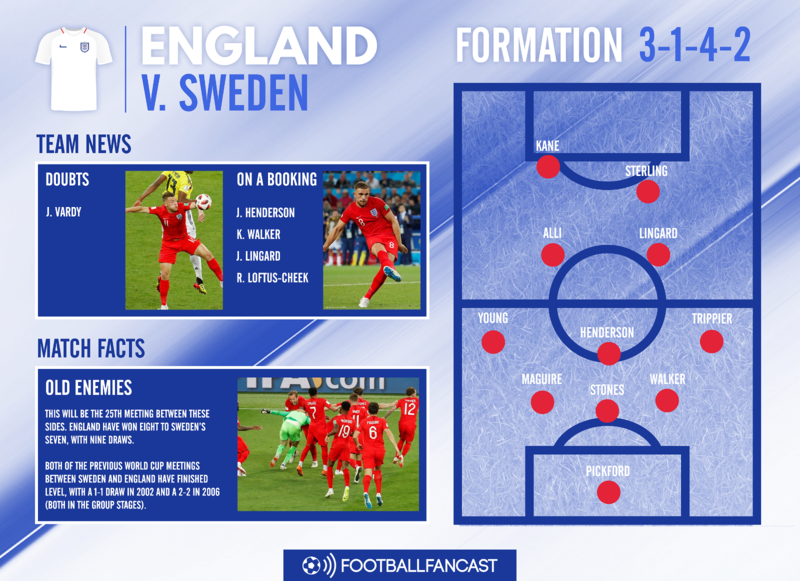 That’s not to suggest it will be an easy game, but the knockout tree has undoubtedly been favourable to the Three Lions, handing them a huge chance to make the World Cup final for the first time since 1966 – provided they get past the Scandinavians, that is. Bizarrely, Sweden are one of England’s most frequent enemies. The two nations have faced each other a whopping 25 times, although just two of those meetings have come at World Cups and both ended in draws, a 1-1 in 2002 followed by a 2-2 in 2006. Overall, England have tasted victory on just one extra occasion though – eight wins compared to seven – which, coupled with the two previous World Cup draws, suggests Saturday’s game will be a surprisingly close one. Sweden too, have enjoyed far more success than England at this stage of the World Cup, winning four of their five quarter finals. The Three Lions, as we all know, tend to choke when this round comes around having surpassed it only twice from eight attempts – in 1966 and 1990. Even bearing in mind the significant disparity in FIFA rankings, Sweden seem more likely to come into Saturday’s game with cool heads. Widely revered as the best referee at this summer’s tournament, Kuipers also took charge of last season’s Europa League final – Marseille’s 3-0 defeat to Atletico Madrid. He’s experienced at World Cup level too; in addition to officiating what will be his fourth game of the current tournament on Saturday, he made three appearances at the 2014 World Cup – including England’s 2-1 loss to Italy in the Group Stages. 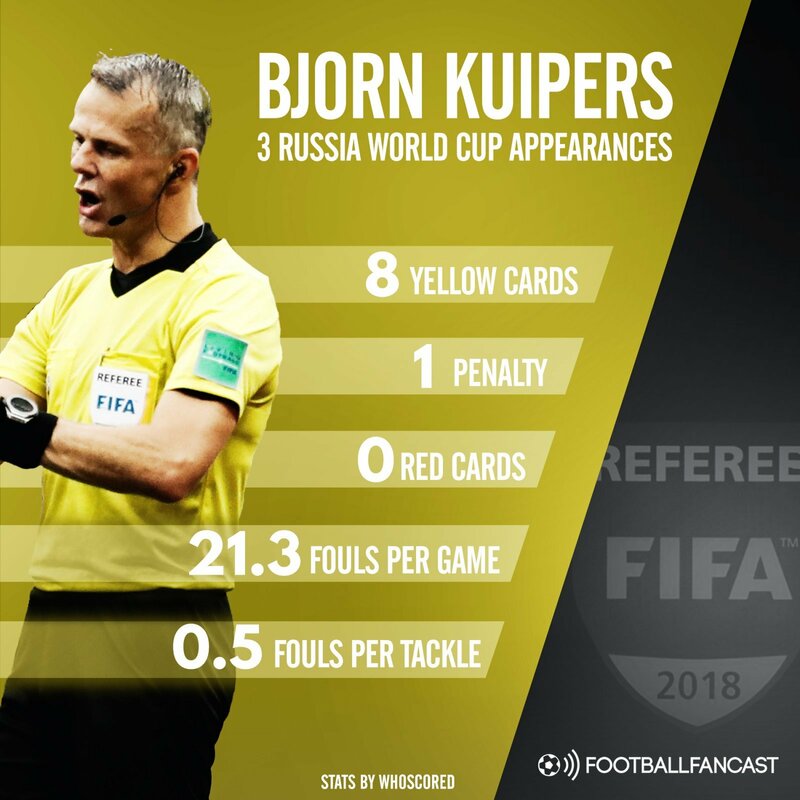 Kuipers has proved himself to be a fairly measured referee, ranking amongst the lowest from the 28 to work at the World Cup for fouls and yellow cards per game and rock bottom for fouls per tackle, but that leniency did draw criticism during his last appearance when he decided not to award Spain a penalty against Russia as Sergio Ramos and Gerard Pique were wrestled to the floor at a corner. There has been some VAR controversy too – he overturned a penalty decision in Brazil’s favour, citing simulation, much to Neymar’s wrath – and a key concern for England should perhaps be that Kuipers is yet to issue a red card at Russia 2018. He’ll want to keep it that way, but the law of averages suggests the Dutchman could be due one. England enter this game with pretty much a full squad at Southgate’s disposal. The only real injury doubt is Jamie Vardy, who appeared to end the win over Colombia with a groin injury – which is why the Leicester City striker ended up not taking a spot kick in the penalty shootout. The Three Lions do have, however, four players on a yellow card. If any of them pick up another against Sweden they’ll be suspended for the semi-final. Regarding Saturday’s game though, Southgate is expected to stick with the same starting XI that defeated Panama and most recently Colombia. That means Manchester United Ashley Young will keep his place over Danny Rose, even though the Tottenham defender impressed in extra time against Colombia, and Manchester City’s Raheem Sterling will get the nod once again regardless of his performances enduring criticism from some quarters. Therefore, there will be no place for Chelsea youngster Ruben Loftus-Cheek, despite Dele Alli struggling for sharpness last time out, or United’s prodigious forward Marcus Rashford.